Your career can take the right turn by passing our 70-505 ebook exam guide, mb5-858 dumps and 70-671 dumps .You can also download 70-640 practice test dumps and 000-153 certification exam kit. In 1846, researchers noticed that Uranus was wobbling in a way that confounded Newton's Law of Motion. This meant they had two options: rewrite the most time-honoured of the laws of physics, or "invent" a new planet to account for the extra gravitational pull. Compared to Newton's reputation, an eighth planet seemed much less massive and Neptune was discovered. Today scientists working in the University of Louisiana have discovered a statistical anomaly of similar proportions. Professors John Matese [see below], Patrick Whitman and Daniel Whitmire have studied the orbits of comets for 20 years, and their recent findings have led to startling theories. Intrigued by the work of two palaeontologists working for the University of Chicago, Prof Whitmire, along with Nasa colleague Dr Al Jackson, had earlier attempted to explain the amazing discovery that six apocalyptic events, including the extinction of the dinosaurs, have all occurred, like clockwork, every 26 to 30 million years. To try to explain this mass extinction cycle, they looked to the possibility that comet showers were to blame. The latest effort of Matese, Whitman and Whitmire studies 82 comets from the huge cloud of comets, called the Oort cloud, that exists around our solar system. They took the aphelia of these comets, the points on their orbit that are farthest from our Sun, and plotted them on a globe. Expecting to find an even distribution, they instead found that a particular band of sky, about one sixth the total, contained more than one quarter of all the comets, and that about 25 per cent of the comets coming from this cloud have anomalous paths. So what was affecting the orbits? They went on to theorise that the best explanation is the existence of a previously unknown body - that our solar system is made up of the Sun and a shadowy partner, either a brown dwarf or a massive planet, in a wide binary system. In effect, the solar system had two stars, the Sun and a dark companion, spinning around each other. Now I know what you're thinking Surely I'd have noticed a second Sun in the sky? But, as Prof Whitmire explained, the process of assumption based on statistical anomalies has always been a cornerstone of scientific discovery. According to their current theory, he says, "the companion is a brown dwarf star or massive planet of mass between two and six times the mass of Jupiter". A brown dwarf is a star too small to sustain the nuclear fusion that powers our Sun, and so is relatively cool (surface temperature of less than 1500C) and so also very dim, being barely hot enough to give off light. But it gets worse. Under their original theory, called the Nemesis theory, this small dark star, which lurks at around 90,000 times farther away than the Earth is from the Sun, may be on an orbit that, once every 30 million years, ploughs it into the densely packed inner cloud. Here its immense gravitational pull would drag out several of the Oort comets and give them the "kick" needed to send them towards the Sun on orbits perilously close to the Earth. This explains, in the professor's view, the ominous mass extinction cycle, due to regular periods of increased cometary activity every 30 million years. However, before we head for the bomb shelters, we should take heed of the professor's words: "As a practical matter our models will never be generally accepted (and shouldn't be) until the actual object is found." However stressing that they are "sufficiently plausibleto give incentives for others to look". Today, their current paper has moved away from the Nemesis theory and proposed, on the basis of comet orbits, a less massive planet about three times the mass of Jupiter. None the less, with an explanation for the mass extinction cycle yet to be found, he has admitted that they may not be mutually exclusive; and that there could be two dark stars, one a failed partner to our own, and another one that is acting almost as an alarm clock for doomsday. Even so, he says: "I'm still hopeful that ultimately these might turn out to be the same object.". "An original idea in science is often a gut instinct, but this should not influence the development of the idea," says the professor. "I always try to be my own worst critic". The scientific world remains intrigued but sceptical. However, the recent bombardment of Jupiter is a reminder that if the team is right, there may not be many around to hear them say: "I told you so." [ABCNEWS.com]Oct. 7 -- Astronomers may have found hints of a massive, distant, still unseen object at the edge of the solar system -- perhaps a 10th planet, perhaps a failed companion star -- that appears to be shoving comets toward the inner solar system from an orbit 3 trillion miles away. Two teams of scientists -- one in England, one at University of Louisiana at Lafayette --independently report this conclusion based on the highly elliptical orbits of so-called "long-period comets" that originate from an icy cloud of debris far, far beyond Pluto. " "We were driven to this by rejecting everything else we could think of," says University of Louisiana physicist Daniel Whitmire. A couple years ago, Whitmire, along fellow physicists John Matese and Patrick Whitman, noticed the farthest points of the comets' orbits didn't appear random but bunched together, tracing a path across the sky. "We accidentally noticed they weren't uniform," Whitmire says. First, they tried to explain the clumping from the gravitational pull from a main disk of stars in the Milky Way stars. "That ultimately didn't work," Whitmire says. "We've gone through several other models trying to explain this." At around the same time, John Murray, a planetary scientist at The Open University in Great Britain, made a similar observation in similar comet data. "I started puzzling what this might could be," he says. The most obvious but seemingly unlikely explanation would be a planet. "I thought weπd better rule that out," he says. But as he analyzed the orbits, the farthest points appeared to fall on a circular orbital path -- "which is exactly what you would expect if there was a planet out there." As the planet -- estimated to have a mass between one and 10 Jupiters -- orbits, its gravitational wake disturbs the icy debris of the outer solar system, causing some of it to plunge toward the sun as comets, sort of like an elephant ambling through a china shop. No one has yet directly observed a 10th planet, and there could still be another cause for the cluster of comets. What's surprising is just how far out there this supposed planet is. Both Murray and the University of Louisiana physicists put the planet in an orbit about 3 trillion miles -- or half a light-year -- from the sun. The nearest star is four light-years away. To put this distance in perspective, consider a miniaturized version of the solar system in which Earth is one inch from the sun. On this scale, Pluto, the ninth planet would be a bit more than a yard from the sun. The new planet, by contrast, would be a half-mile distant. At that great distance, the 10th planet would be too dim to see by current telescopes, although there is some hope that if it exists, the next generation of space-based infrared telescopes might be able to pick it up. Murray hypothesizes the planet may have been wandering through the galaxy before being captured by the solar systemπs gravity. Whitmire suggests it is a "brown dwarf," or a failed star, a companion to the sun that was too small to light up. Although suggestive, the findings are not conclusive. While Murray and the Louisiana physicists agree how distant the new object is, they trace out very different orbits. Murray considers the orbits of 13 comets with the most accurately known orbits; the Louisiana team considers 82. "It's possibly suggestive," comments Brian Marsden, associate director for planetary sciences at the Harvard-Smithsonian Center for Astrophysics in Cambridge, Mass. "I don't want to bet on it. We're certainly not going to name it." Whitmire agrees it's too early to say definitely there's something out there. "Until it's found, you can never be overly confident," he says. "We know in science you can be fooled by statistics." But he adds, "If I was betting, it's better than 50-50 odds that it's there." The bulk of my recent research activity has centered on the Oort comet cloud. In particular, the distributions of observed orbital elements can differ from the in-situ distributions because of observational selection effects and observational uncertainties. Of more interest dynamically is the imprint of the physical mechanism responsible for making these comets observable. To make a comet observable its perihelion distance, q, must be reduced to sufficiently small values that the solar insolation will create a detectable coma. Since the angular momentum of a near-parabolic orbiting Oort cloud comet is proportional to q1/2 , to reduce q we must reduce angular momentum, and the tidal torque of our Milky Way Galaxy is the dominant mechanism for doing so. Specifically, we argue that the tidal torque due to the smoothed matter density of the galactic disk leaves its own signature on these Oort cloud comet orbital element distributions. Thus "what you see is not what you've got out there." A substellar solar companion in the Oort cloud? The following figure illustrates the scatter on the celestial sphere of outer Oort cloud comet aphelia directions in galactic coordinates. The pronounced deficiencies at the galactic equator and at the galactic poles are characteristic of the galactic interaction which is minimal at these locations. 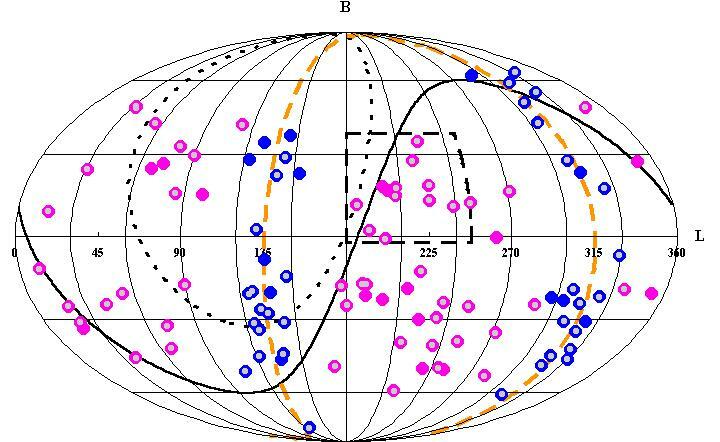 But we also note an anomalous concentration of points along a "great circle" which passes near the galactic poles. In an article in the journal Icarus, we have suggested that there is statistically significant evidence that this concentration, amounting to an excess of approximately 25%, could be caused by a companion to the Sun which aids the galactic tide in making Oort cloud comets observable. The companion is estimated to have a mass of 3 MJupiter and a mean distance at the interaction site of 25000 AU. Its location along the great circle is not presently predictable and that will present a problem for detection, but it is potentially observable in the radio using the VLA and should also be observable in the infrared at 5 microns using the next generation of space telescopes such as SIRTF and SOFIA. An object with these properties would be readily seen by NGSS (Next Generation Sky Survey), one of four missions selected for further Phase A study in NASA's MIDEX program. The estimated mass of the companion puts it below the nominal brown dwarf limit (~ 13 MJupiter ) where deuterium fusion can occur and would make it a planet in that context. However its location in the outer Oort cloud means that it is not possible that it formed in the protosolar planetary disk. The object could have been ejected from another stellar system and captured by the Sun in their complex star forming region. At the IAU Symposium 202 "Planets in the Universe" we have presented supportive evidence of the solar companion conjecture. Since the Icarus paper was published twenty seven new outer Oort cloud comets have been discovered. The previously noted overpopulated band maintains an excees. This strengthens the statistical evidence for correlated orbital elements as predicted by the analysis. The figure below includes the best fit perturber orbit and can be compared to the corresponding figure in the Icarus paper which did not include the new data. It is argued that the correlated data found is highly unlikely to be the result of "bad data" - which typically reduces real correlations. Nor is it likely to be spuriously produced by some unspecified "observational selection effect" - a situation where limitations on our ability to observe comets can spuriously affect the distributions of the observed data. To date, the only documented observational selection effect applicable to this data is the well-known one that comets with large perihelion distances are less likely to be sufficiently well observed so that their energies (i. e. semimajor axes) are accurately known. We discuss in these papers why this selection effect will tend to spuriously reduce the predicted correlations rather than enhance them. A recent paper ("Biases in Cometary Catalogues and Planet X", J. Horner and N. W. Evans, MNRAS (2002), in press) has concluded that a bound Jovian mass companion is a "possible, perhaps even likely, explanation of the unusual pattern". Aphelia scatter of "new" comets (original semi major axes a>10 000 AU) with well-determinined orbits (Class I ; 14th Catalogue of Cometary Orbits, 2001) in galactic coordinates. long dashed black line: Encloses a weak stellar shower identified by Biermann, Huebbner and Lust (1983) - note that the arc is unconnected with the putative Biermann shower. short dashed black line: Encloses the antipodal region to the south equatorial pole, a region largely unavailable to observers in the northern hemisphere - note that this well known observational selection effect does not manifest itself in these data as a pronounced deficiency. Icarus 141, 353 (1999) reprint on a putative companion to the Sun ACM 2002 Berlin Talk: "Continuing Evidence of an Impulsive Component of Oort Cloud Cometary Flux"
Time dependence of the Oort cloud comet flux. In this modeling the weak stellar impulse contribution is taken to be constant and modest amounts of CDDM are included to reduce the average plane crossing period to 36 Myr from its no DDM value of 45 Myr. This results in a best fit with observed large crater formation. Time dependence of the tidal induced Oort cloud comet flux Since the galactic tide dominates in making Oort cloud comets observable today (and is also likely to do so when averaged over long time scales) we can inquire about the long-timescale variability of the tidal interaction which is connected to the solar oscillation about the galactic midplane. Below we show a modeled time dependence of the flux which is most consistent with the occurrence of large craters. Shoemaker has argued that the largest craters are dominated by long period comets originating in the Oort cloud. Still being debated is the actual period of the oscillations. Only if the long term average of the midplane crossing period falls in the range 34-37 Myr would this hypothesis be viable. A no-dark-disk model would yield a period of about 45 Myr. There must be modest amounts of compact dark disk matter distributed over scale heights of about 50 pc if the tidally produced modulation of the Oort comet flux is indeed the cause of substantive periodic modulation of large crater formation. 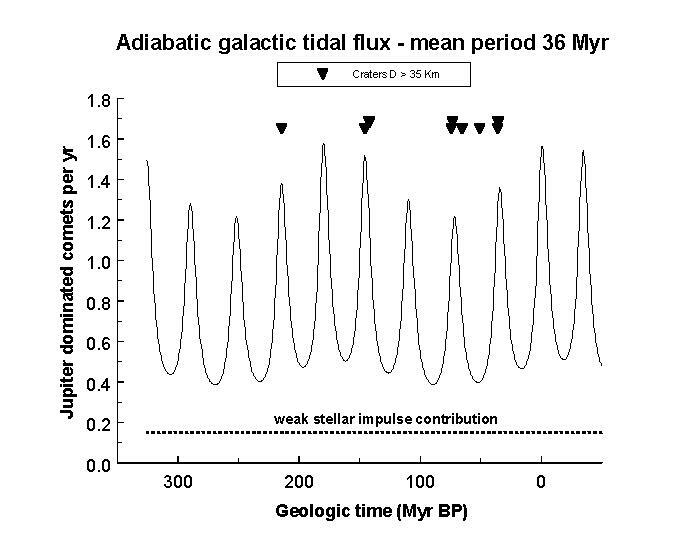 In a review paper recently published ["Variable Oort Cloud Flux Due to the Galactic Tide", in "Collisional Processes in the Solar System", Astrophysics and Space Science Library, Eds. M. Marov, H. Rickman , Vol. 261 91-102 (2001) J. J. Matese, K. A. Innanen and M. J. Valtonen Assl (pdf) paper ] this topic is discussed in detail. Recent Hipparcos data (Holmberg and Flynn, MNRAS 2000) indicates that there is no evidence of significant amounts of compact dark disk matter in the local region of the Milky Way disk If this result is also applicable to the solar vicinity of the galactic disk during the past 225 Myr, then we must conclude that even though there is substantial modulation of the Oort cloud comet flux over long timescales, it will not manifest itself in the cratering record.